I am not so sure what we told our travel agent. He kept trying to put us in Junior Suites and the best room types in every hotel. For the most part we managed to reign him back to the reality that we aren't super-rich hedonists, just the average wage earning, no commitment type of hedonists. But we missed his shenanigans on this part of the itinerary. It must not have made a huge bottom-line difference, but he has us booked on the 'Premium' cruise and not in the lead-in room. We are currently sitting, post-buffet, in the lounge of a beautiful wooden junk boat on Ha Long Bay—one of the seven new wonders of the world and a UNESCO Heritage site. A king-size bed in a cabin with a balcony and spa bath beckons, loudly. We're almost too tired to answer. But I have missed the deadline for the squid fishing from the tender (small boat they drag behind for transporting people from the large boat to the attractions. It is a little Club Med. Every minute is hyper-organised. 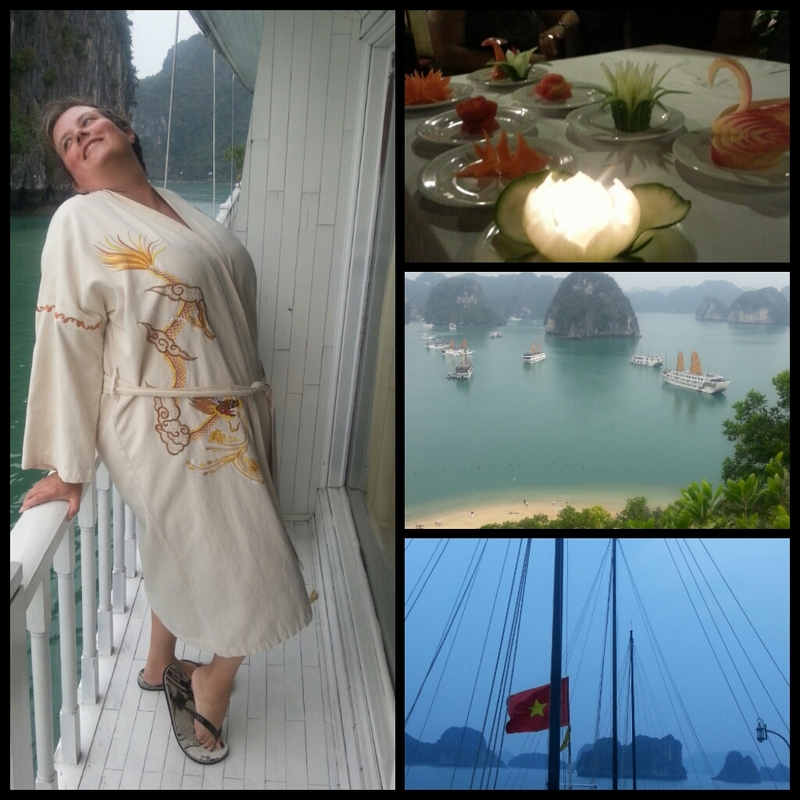 We've eaten twice, had happy hour, climbed a karst, canoed through a cave to a mini bay amongst the islands where monkeys played cheekily on the shore and watched a fruit carving demonstration. It is nearly time for games. Anyone for Scrabble? Or Mah Jong? But you'll have to remind me of the rules. And then it will be happy hour, take two. Not sure if I can. In the morning Tai Chi begins on the upper deck at seven and we are going to try to beat the crowds into Surprise Cave at seven thirty-five. Now I think I know what a train feels like with its tracks and its timetables. The ship does boast the best dipping sauce of the trip to date. Huge healthy chunks of chilli, coriander and garlic. Lots of it. Masterchef judges would have waxed lyrical about its authenticity. You know when you go to Italy and the pizza is this thin crust pastry with a smear of tomato and a breath of cheese. And you think back to the piled-high, deep-pan smorgasbords of flavour you have it home and sigh. Well, I don't mean to sound negative, but I think the same happens here. That, or the possibly more likely scenario in which we just aren't choosing the right things. At home the flavours seem bigger, spicier maybe, veggier for sure. Maybe it is like people who emigrate somewhere and take the quintessentialness of their culture with them. It gets stuck in isolation and becomes bigger than itself to the point where meeting someone of the same nationality on their own home-soil makes them seem an insipid copy of the largess of the displaced (voluntarily or involuntarily) person. Maybe Vietnamese flavour gets bigger when it is displaced. I will keep you posted on this idea. An aside: I am yet to see a Vietnamese word longer than six letters. I am intrigued to know how they say things we take fourteen letters to say, like 'quintessential'. Or thirteen like 'involuntary'. There is probably a simple, clean way to say these things that puts my pretentious words to shame. 'Stands for' or 'not by choice'. I find it leaves a mark (impressive). 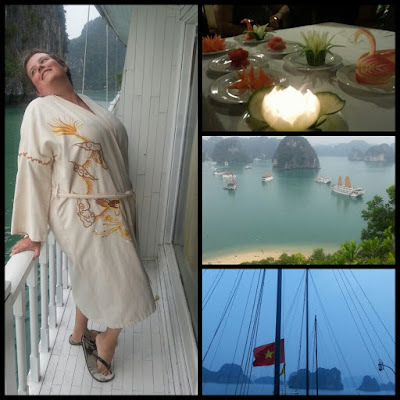 List_Addict's Outfit and Distractions Bathrobe: Room 203, Indochina Sails Premier Shoes: room 203, Indochina Sails Premier Photos (clockwise from left): Me on the balcony of Room 203, Indochina Sails Premier; fruit and veggie carving; Ha Long from Ti Top summit; sails and the Vietnamese flag on top deck at twilight.